The first UIM Class 1 World Offshore Powerboat Championship (CLASS1) Grand Prix and the 2013 UIM World Aquabike Championship (AQUABIKE) pro artistics Grand Prix of Sanya, China will be held in Sanya Bay from March 27 to 30. CLASS 1 is widely regarded as the pinnacle of international offshore powerboat racing, and is officially sanctioned by the Monaco based Union Internationale Motonautique (UIM). The sport is very popular in America, Europe, the Middle East and other developed areas thanks to its high-speed, high-adrenalin fun. 18 top racers from nine of the world’s top teams from 10 countries around the world including the United States, Britain, Italy, Dubai, Norway, and the United Arab Emirates will compete with each other at CLASS1 in Sanya this March. AQUABIKE, as the only pro artistics motorboat event in the water of UIM, will be the most exciting competition, and 70 racers from 15 countries will attend the event. In addition, a beach ride festival, city parade, yacht babe contest, fashion theme party and other large-scale cultural activities will be held during the period. 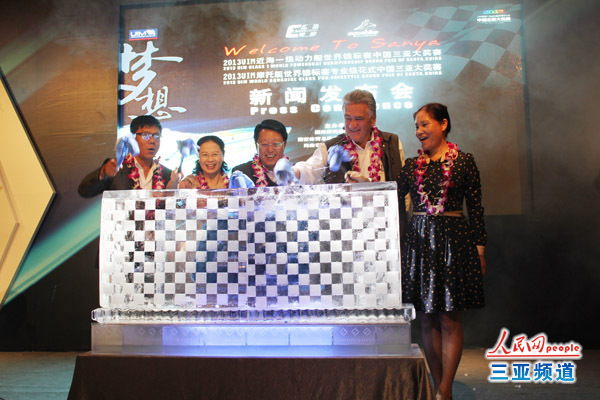 Scott Robert Gillman, now 54 years old, the famous American racer and four-time annual World Champion F1 Powerboat racer, will take part in the event representing Sanya, and steer the powerboat ‘Sanya Visun’ through its debut in the race.